Crafty Corner ~ Christmas Time! It's time for some fun alphabet crafts!! We hope you enjoy these! If you are new, you can visit our ABC webpage to find links to any other letters we have done as well as links for upcoming books! Summary: Rosie the hen goes for a walk…but is followed closely by the fox! Rosie doesn’t realize the trouble she is in, but the fox is the one that ends up with all the trouble in the end! Trace and cut an uppercase 'F' out of the foam sheet or construction paper. I used a foam sheet that was about 4" x 5" in size. Using the extra foam, cut out two small triangles for ears. Cut out a tail from the fake fur. 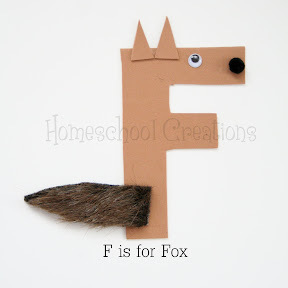 Glue the ears, tail, eye and nose onto your letter F.
I love Rosie's Walk. We read it over and over when my sisters and I were little.